NEAT HAT IN SUPER CONDITION – LOOKS NEW! 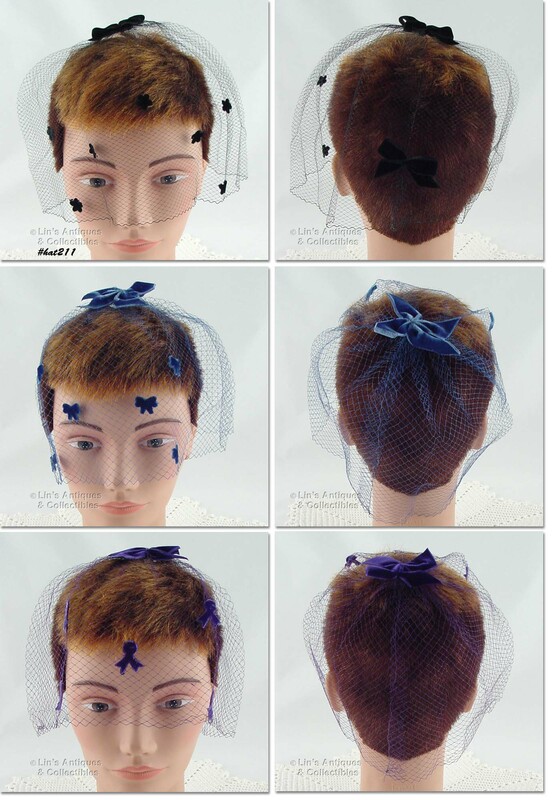 HAT IS LOVELY NAVY BLUE COLOR WITH NAVY BLUE NETTING VEIL AND IS ACCENTED WITH 2 GROSGRAIN RIBBON BOWS ON TOP OF HAT. PRETTY! LOVELY TURBAN STYLE HAT IN NAVY BLUE! PER LABEL, IT IS 100% NYLON AND WAS MADE IN ITALY. THIS IS A BEAUTIFUL HAT! 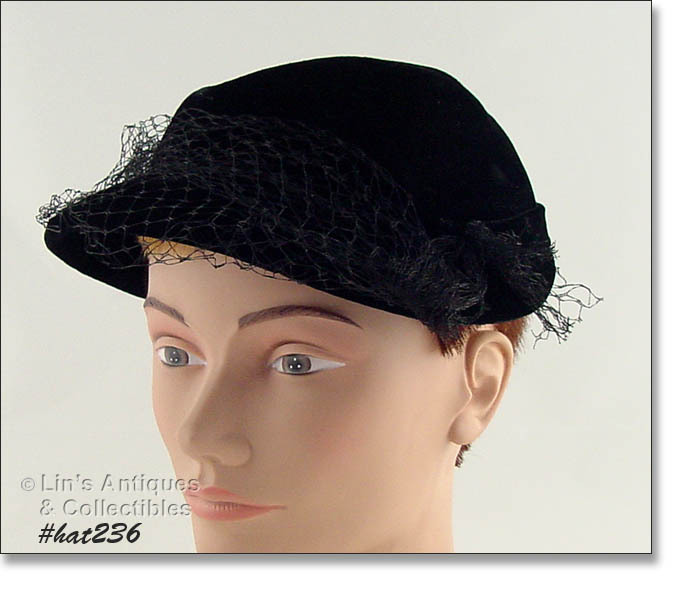 MADE BY BELLINI, NEW YORK, HAT IS BLACK WITH BLACK NETTING VEIL. 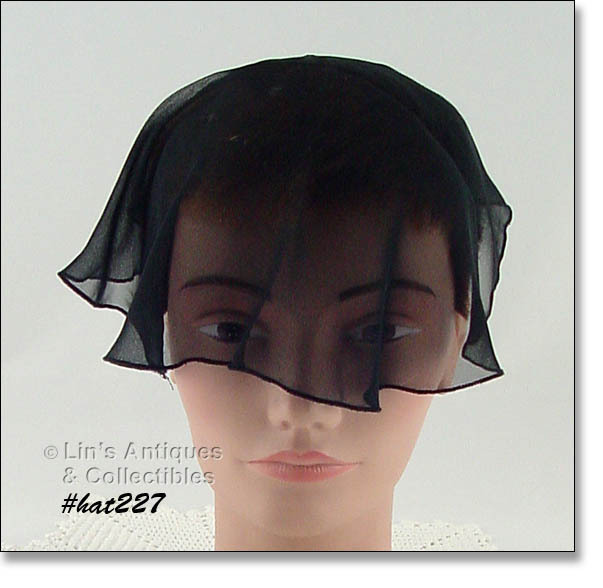 THE VEIL IS ACCENTED WITH “BEAUTY DOTS” AND BACK OF HAT HAS A BLACK RIBBON BOW AND A SMALL “SPRAY” OF BLACK FEATHERS OVER A POINTED WIDOW’S PEAK AT BACK OF HAT! YOU’LL LOVE IT!! GORGEOUS WHITE HAT – SUITABLE FOR A WEDDING! THIS IS SUCH A PRETTY NETTING HAT! IT’S GREEN WITH ATTACHED GREEN VELVET RIBBON. IT HAS ALWAYS BEEN CAREFULLY STORED TO RETAIN ITS SHAPE (SEE PHOTO). ANOTHER EXCELLENT CONDITION VINTAGE HAT! I’M NOT AN EXPERT ON FUR BUT I BELIEVE THIS IS MINK. 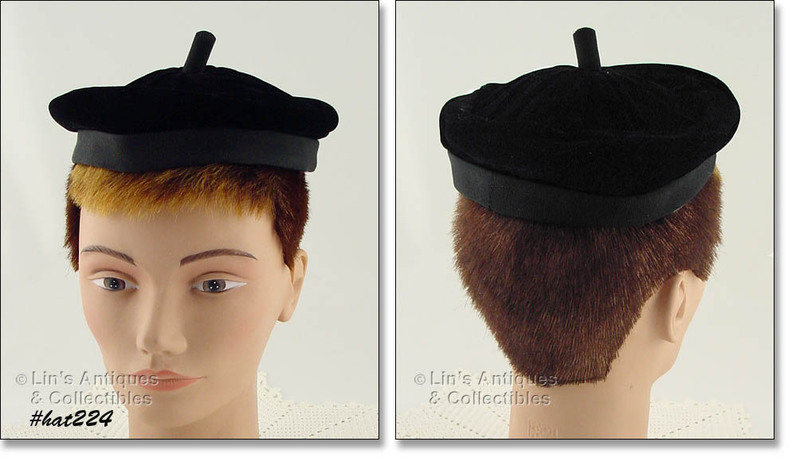 THE HAT HAS A RATHER CONE SHAPE (AT TOP) AND SETS ON YOUR HEAD ALMOST LIKE A BERET. IT HAS TWO SMALL COMBS TO SECURE TO YOUR HAIR. INTERIOR LABEL READS “GARTH’S, EVANSVILLE, INDIANA”. GORGEOUS! 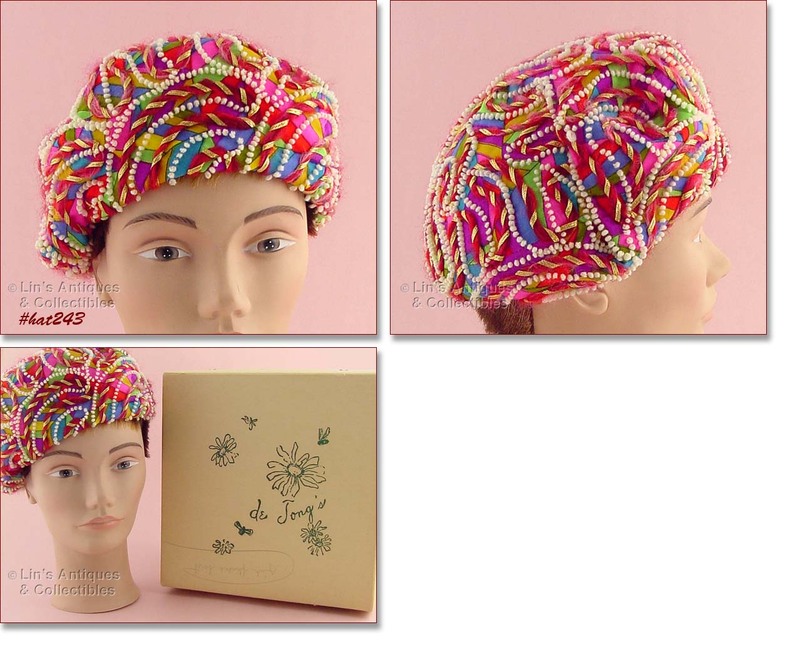 THIS HAT IS UNUSUAL, COLORFUL, AND VERY PRETTY – IT’S COVERED WITH RED “ROSES”! IT’S IN SUPER CONDITION AND HAS 2 SMALL COMBS TO SECURE TO YOUR HAIR. HAS 2 LABELS – “LESLIE JAMES, TRADEMARK” AND “GARTH’S, EVANSVILLE, INDIANA”. SUPER! NEAT HAT – LABEL STATES “KANGOL DESIGN, MADE IN UNITED KINGDOM”. I BELIEVE THIS HAT IS FUR FELT, PROBABLY HAS SOME RABBIT FUR CONTENT. I PURCHASED THIS HAT AND OUR HAT241 AT THE SAME ESTATE SALE. THEY HAVE THE SAME STYLE AND APPEARANCE SO I BELIEVE THEY ARE BOTH KANGOL DESIGNS (THE LABEL HAS BEEN REMOVED FROM HAT241) SO I CANNOT BE POSITIVE. ISN’T THIS A COLORFUL HAT? IT HAS A LABEL – DE JONG’S, EVANSVILLE, IN – AND IS IN THE ORIGINAL HAT BOX. PRIOR OWNER WROTE ON BOX “PINK FLECKED BERET”. VERY PRETTY HAT! EXCELLENT CONDITION VINTAGE HAT! IT’S IVORY (OFF-WHITE) COLOR WITH NETTING VEIL. HAT HAS LABEL: “LESLIE JAMES, TRADEMARK”. VERY NICE! I RECENTLY PURCHASED SEVERAL BEAUTIFUL VINTAGE HATS AND THIS IS ONE OF THOSE HATS! THE LABEL HAS BEEN REMOVED FROM THIS HAT BUT IT IS THE SAME MATERIAL AS OUR HAT244 (PURCHASED AT THE SAME SALE). I BELIEVE THESE ARE FUR FELT WHICH DOES HAVE FUR CONTENT (PROBABLY RABBIT). SEE OUR HAT244 FOR FURTHER INFO/DETAILS. I’VE GROUPED 4 VERY PRETTY HATS INTO THIS LISTING! 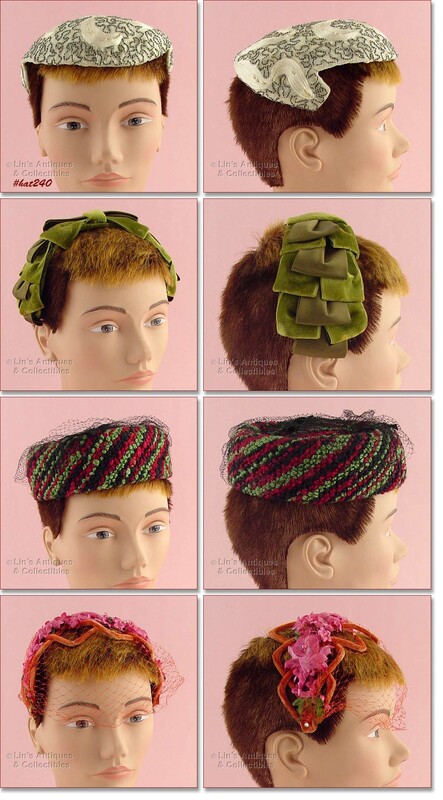 THE MULTI-COLOR HAT IS A PILLBOX SHAPE WITH BLACK NETTING ON TOP THAT I BELIEVE WAS ADDED TO “DRESS UP” THE HAT AND COULD PROBABLY BE REMOVED TO WEAR BY ITSELF OR WITH A CAGE STYLE HAT THAT NEEDS A VEIL. THE ORANGE/RUST COLOR IS A BAND TYPE HAT AND IT HAS ORANGE NETTING VEIL. THE GREEN HAT IS ALSO BAND STYLE. THE LOVELY WHITE ONE PROBABLY HAD A NETTING VEIL AT ONE TIME THAT WAS PROBABLY DAMAGED DURING STORAGE –NOT UNUSUAL WITH THIS STYLE HAT. THE HAT HAS BEAUTIFUL BEAD WORK. NEAT LISTING! 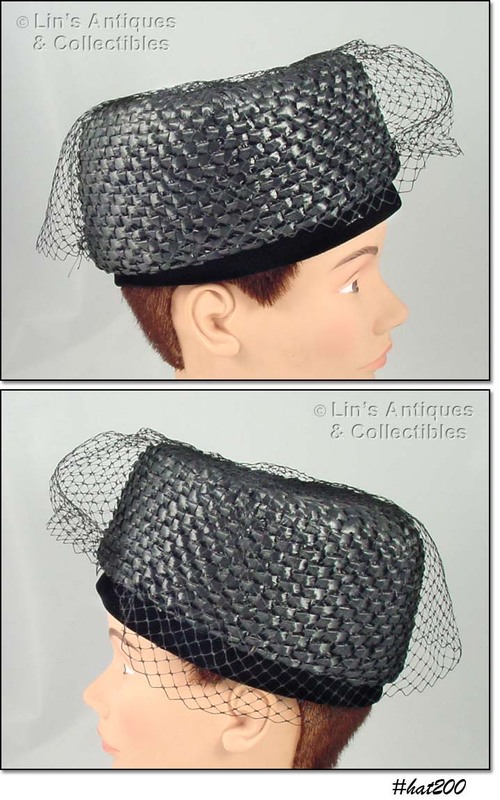 VERY PRETTY BLACK VELVET BAND (OR CAGE) STYLE HAT WITH BLACK NETTING VEIL! EXCELLENT CONDITION. SUPER NICE HAT! 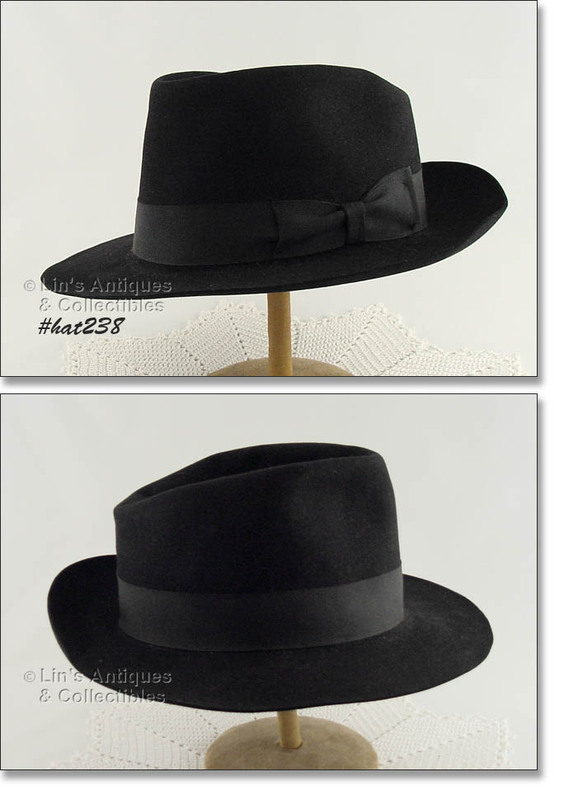 IT’S A BLACK FEDORA STYLE WITH BLACK GROSGRAIN RIBBON TRIM. INTERIOR HAS A LEATHER BAND THAT’S STAMPED “THE MIDDLETON HAT, DELUXE QUALITY”. HAT IS IN SUPER CONDITION – THE LEATHER BAND IS COMING UNSTITCHED IN THE BACK (A SIMPLE REPAIR). TAG SHOWS HAT IS SIZE 7 ¼ WHICH INDICATES THIS TO BE A MAN’S HAT, HOWEVER BECAUSE OF ITS SMALL SIZE, IT IS SUITABLE FOR A WOMAN (AND LOOKS GREAT). NEAT! THIS IS ANOTHER VERY PRETTY HAT WITH UNUSUAL ORNAMENTATION! HAT IS NAVY AND IT HAS HORSE HAIR TRIM THAT IS HELD ONTO THE HAT WITH A LEAF SHAPED HOLDER THAT IS MADE OF THE SAME MATERIAL AS THE HAT – UNUSUAL AND VERY NICE! THIS IS A VERY PRETTY HAT WITH SIMPLE STYLING! IT HAS A BAND AT BACK AND A BLACK NETTING VEIL. THE VEIL HAS A PIN AT EACH END AND I BELIEVE YOU COULD ARRANGE THE VEIL TO BE LONGER (COVERING YOUR EYES/FACE). IT IS CURRENTLY PINNED TO BE A SHORT VEIL/HAT ACCENT. NICE! EXCELLENT CONDITION BURGUNDY COLOR HAT WITH BLACK NETTING VEIL! IT HAS A COUPLE BLACK FEATHERS THAT ARE PROBABLY ADD-ONS. NEAT HAT! ANOTHER PRETTY HAT! IT IS IN EXCELLENT CONDITION, NETTING VEIL HAS A COUPLE SNAGS/TEARS. PRICED TO REFLECT IMPERFECTION IN VEIL. THIS IS A NEAT AND RATHER UNUSUAL HAT – IT’S BLUE AND GRAY WITH BLUE NETTING VEIL! IT’S IN SUPER CONDITION. 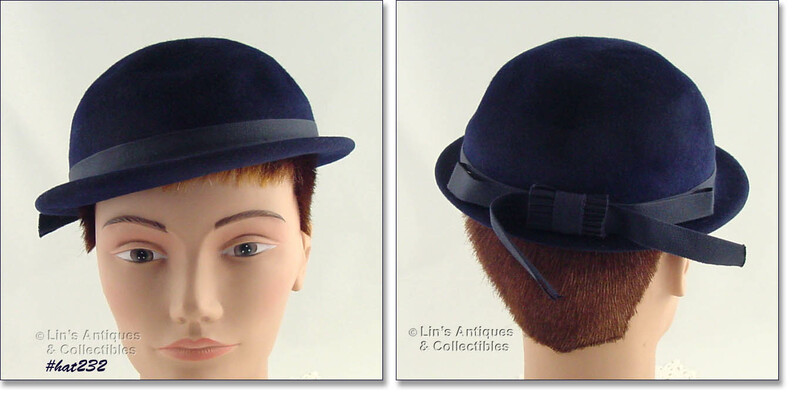 EXCELLENT CONDITION GLENCOVER NAVY BLUE HAT BY HENRY POLLAK OF NEW YORK! 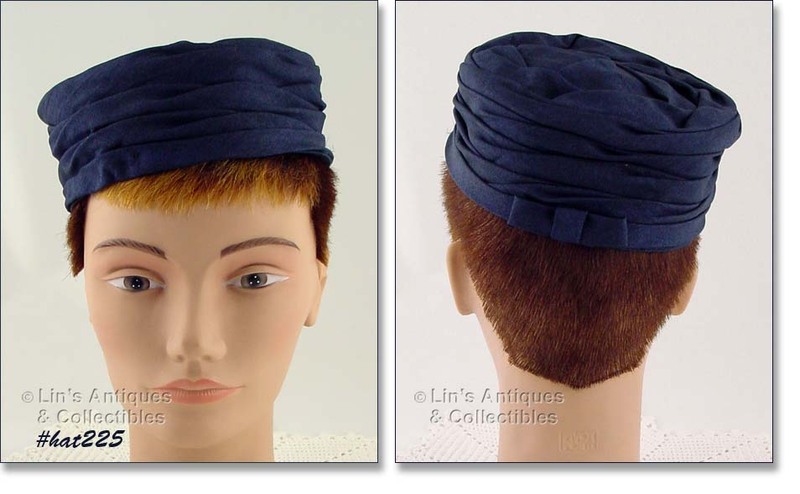 HAT HAS A NAVY GROSGRAIN RIBBON AND BOW TRIM AND IS IN EXCELLENT CONDITION. SIZE IS 22. VERY NICE! THIS IS A REALLY NEAT HAT! IT IS AN IMPERIAL HAT, 100% WOOL, MADE IN USA. IT HAS A REALLY LONG BLACK NETTING VEIL. THE VEIL HAS BEEN LIGHTLY TACKED TO THE HAT – I CANNOT BE CERTAIN WHETHER THIS VEIL IS ORIGINAL TO THE HAT OR IF IT WAS ADDED BY A PRIOR OWNER. 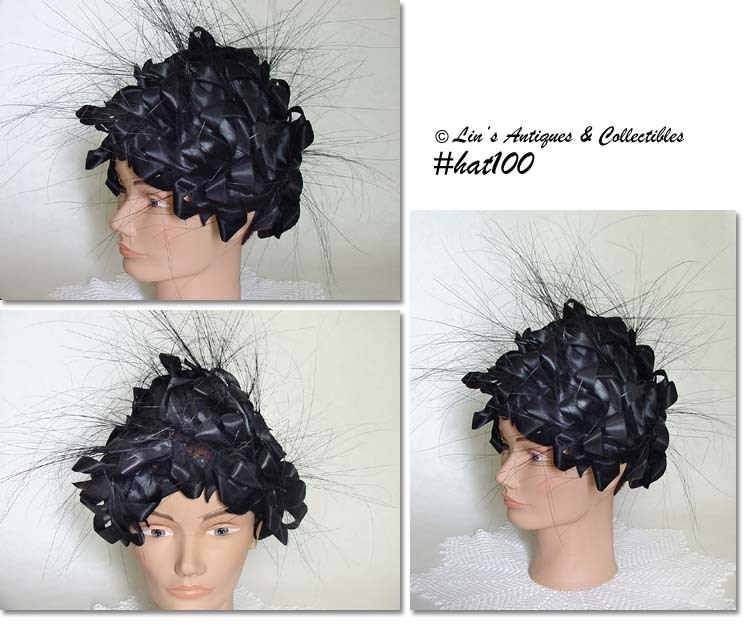 HOWEVER, THE ATTACHED BLACK OSTRICH FEATHER IS AN ADD-ON AND HAS BEEN SECURED TO THE HAT WITH A SAFETY PIN. THE HAT, FEATHER, AND VEIL ARE IN WONDERFUL CONDITION. I NOTICED A COUPLE SMALL SNAGS/TEARS ALONG THE EDGE OF THE NETTING – THAT’S IT! THIS BLACK CHAPEL SCARF IS SO PRETTY AND IS ALSO UNUSUAL – IT HAS HEARTS! SEE PHOTO – IT’S LOVELY. ANOTHER GORGEOUS CHAPEL SCARF! THIS ONE IS BLACK AND IS THE SHORTER SIZE. LOVELY – SEE PHOTO. BEAUTIFUL WHITE CHAPEL SCARF – SEE PHOTO – IT’S GORGEOUS! 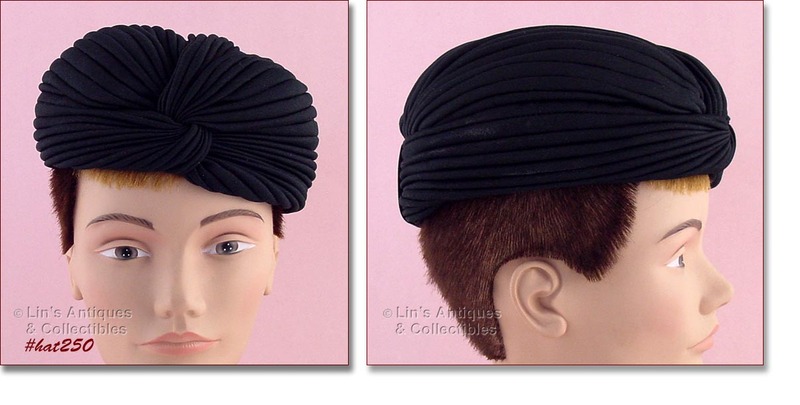 THIS NEAT BLACK HEAD COVERING CAN BE WORN BY ITSELF OR WITH A BAND STYLE HAT (OR THE BLACK VELVET HEAD BAND WE JUST LISTED)! 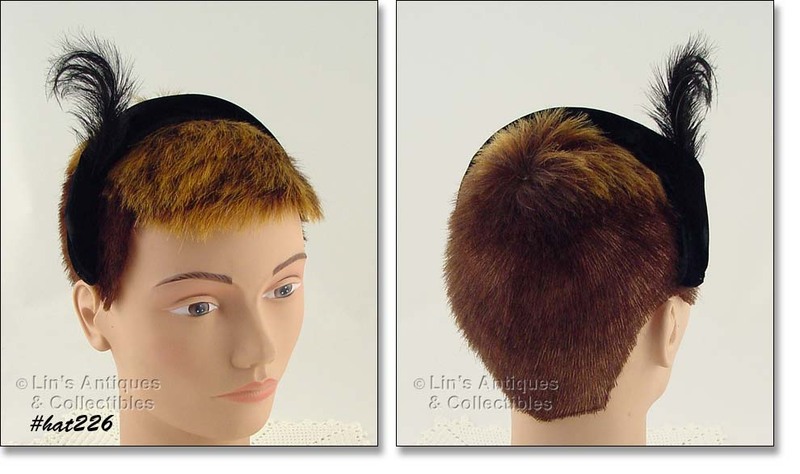 THIS LISTING HAS A BLACK VELVET HEAD BAND STYLE WITH AN ATTACHED BLACK FEATHER! 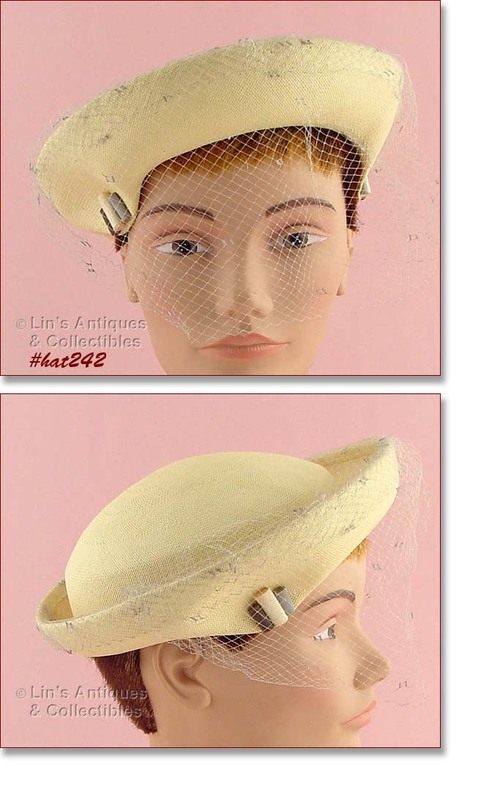 LOOKS GREAT ALONE AND IT WOULD ALSO LOOK GREAT WITH THE BLACK HEAD COVERING (OUR #HAT227) THAT WE JUST LISTED. SUPER NICE NAVY BLUE PILLBOX STYLE HAT! HAS A SMALL BOW IN BACK – PRETTY. NEAT BLACK VELVET HAT! LABELS INSIDE: “JULLE –PATTE” AND “WOLF & DESSAUER”. IT HAS 2 SMALL COMBS TO HOLD HAT IN PLACE. 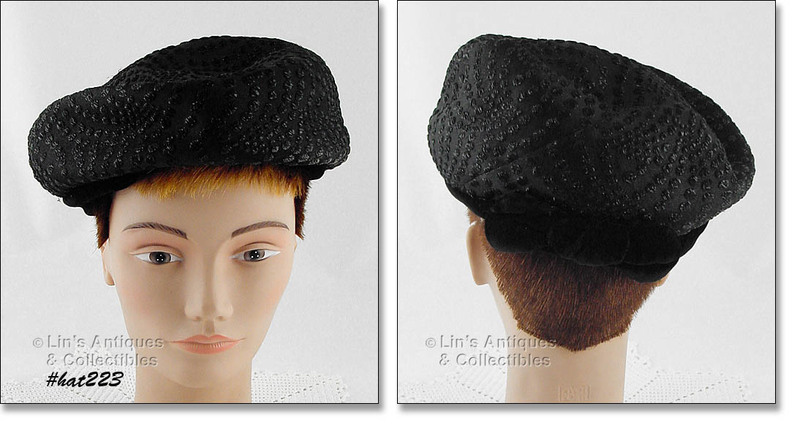 THIS LISTING HAS A REALLY NEAT BLACK HAT! IT HAS BLACK VELVET BAND AND A BOW – PRETTY! 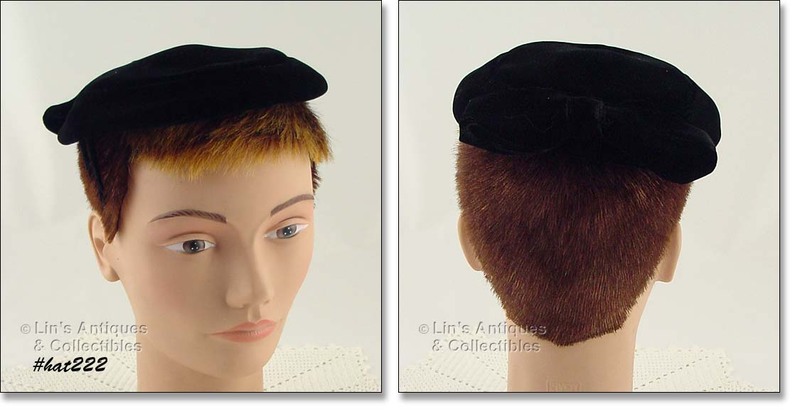 THIS LISTING HAS A REALLY CUTE LITTLE BLACK VELVET HAT! IT HAS A BOW IN BACK AND INSIDE LABEL IS “STEWART’S, KENTUCKY”. STEWARTS WAS A VERY NICE KENTUCKY DEPARTMENT STORE THAT ALAS, WENT OUT OF BUSINESS MANY, MANY YEARS AGO. THIS HAT IS IN WONDERFUL CONDITION BUT IT ORIGINALLY HAD A NETTING VEIL THAT HAS BEEN REMOVED BY A PRIOR OWNER. THIS IS AN UNUSUAL AND VERY EYE-CATCHING HAT! IT’S NAVY BLUE WITH RIBBON TRIM. NEAT! THIS NETTING HEAD COVERING IS SIMPLY OUTSTANDING! 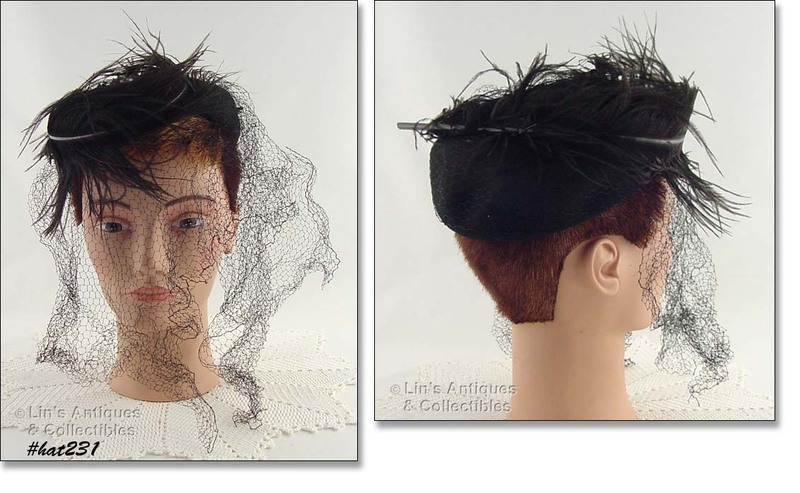 IT IS BLACK NETTING VEIL STYLE WITH BLACK FEATHERS ON TOP. SUPER! THIS NEAT VEIL HEAD COVERING HAS A TAUPE/LIGHT TAN COLOR VEIL WITH A TAUPE/TAN VELVETEEN BOW ON TOP AND BACK CENTER! THE VEIL IS ACCENTED WITH TAUPE COLOR DOTS. PRETTY! TWO AVAILABLE -- NEAT VEIL HEAD COVERINGS! THESE ARE BLACK WITH BLACK VELVETEEN BOWS ON TOP. ONE HAS BLACK VELVETEEN BOWS ON THE NETTING WHILE THE OTHER HAS BLACK VELVETEEN BIRDS!! THIS TYPE HEAD COVERING IS PRETTY WORN ALONE OR YOU COULD ADD A BAND TYPE HAT! ANOTHER SUPER NEAT BLACK VEIL HEAD COVERING! THIS ONE HAS A BLACK VELVET BOW ON TOP AND ONE ON CENTER BACK. FRONT HAS 5 ROWS OF 3 BLACK VELVET CIRCLES/DOTS WITH A CLEAR RHINESTONE AT THE BOTTOM OF EACH – WOW – AND IT’S IN EXCELLENT CONDITION! THIS VEIL HEAD COVERING IS SUPER! 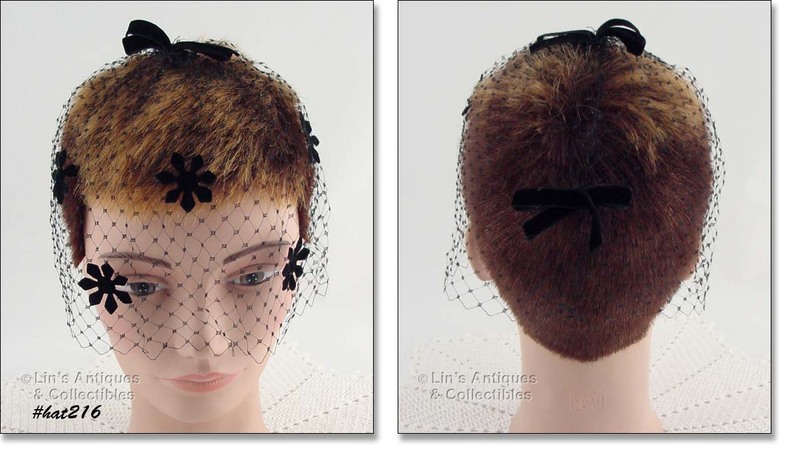 IT’S BLACK NETTING WITH A BLACK VELVET BOW ON TOP AND A BLACK VELVET BOW IN BACK CENTER. THE VEILING IS ACCENTED IN FRONT WITH 5 BLACK VELVET SNOWFLAKES (THAT’S WHAT THEY LOOK LIKE TO ME). EXCELLENT CONDITION! 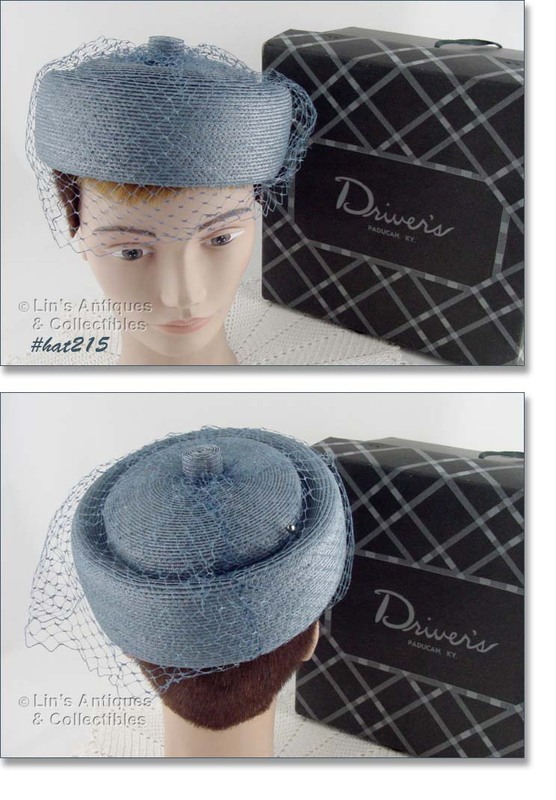 THIS LISTING HAS AN EXCELLENT CONDITION BLUE HAT WITH BLEU NETTING VEIL! THE VEIL IS THE SHORTER STYLE – JUST BELOW THE EYES. HAT APPEARS TO HAVE NEVER BEEN WORN AND IS IN A “DRIVERS” STORE HAT BOX FROM PADUCAH, KENTUCKY. SUPER! ANOTHER BEAUTIFUL HAT! THIS ONE HAS A NETTING VEIL – PLEASE SEE PHOTOS – IT’S SUPER! THIS HAT IS ABSOLUTELY GORGEOUS! IT’S PERFECT FOR A WEDDING – PLEASE SEE PHOTOS TO APPRECIATE HOW PRETTY THIS HAT REALLY IS – YOU’LL LOVE IT! ISN’T THIS A PRETTY SPRING HAT? IT HAS LOTS OF PRETTY PINK FLOWERS, PINK RAFFIA WITH INTERWOVEN PINK RIBBON, AND A GROSGRAIN PINK RIBBON WITH BOW IN BACK. REALLY NEAT! 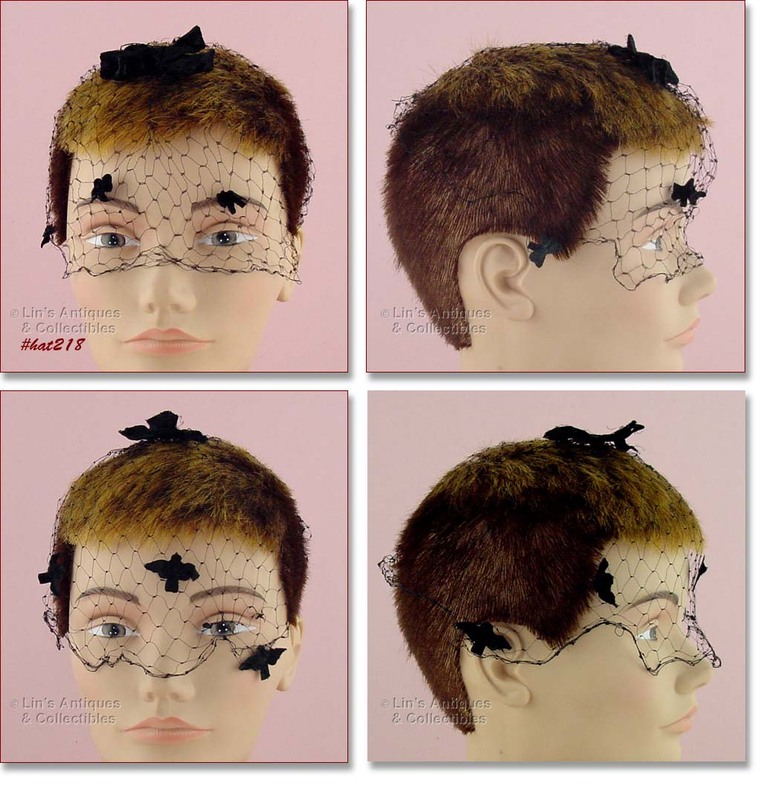 THERE ARE 3 PRETTY NETTING VEIL / HEAD COVERINGS AVAILABLE IN THIS LISTING! THERE IS A PRETTY BLACK COLOR, A PURPLE, AND A BLUE COLOR – EACH IS LOVELY. HEAD COVERINGS CAN BE WORN BY THEMSELVES OR IF YOU HAVE A BAND/CAGE STYLE HAT NEEDING A NEW VEIL – PERFECT!! THIS IS A NEAT HAT! IT’S OFF-WHITE COLOR WITH AN OVERLAY OF BLACK NETTING AND A BLACK NETTING “POUF” AT BACK THAT’S ACCENTED WITH SEQUINS. PRETTY! SIMPLY OUTSTANDING HAT BY CHRISTIAN DIOR!! HAT IS DECORATED WITH BLACK RIBBONS AND HAS WHAT APPEARS TO BE BLACK HORSE HAIRS(?) PLACED RANDOMLY ON THE HAT. INTERIOR HAS TAG: CHRISTIAN DIOR CHAPEAUX, PARIS – NEW YORK. IT DOESN’T HAVE A SIZE TAG BUT MEASURES APPROXIMATELY 21 ½” AROUND INSIDE. EXCEPTIONAL HAT FOR DISPLAY OR WEAR!! ANOTHER GORGEOUS CAGE STYLE HAT! 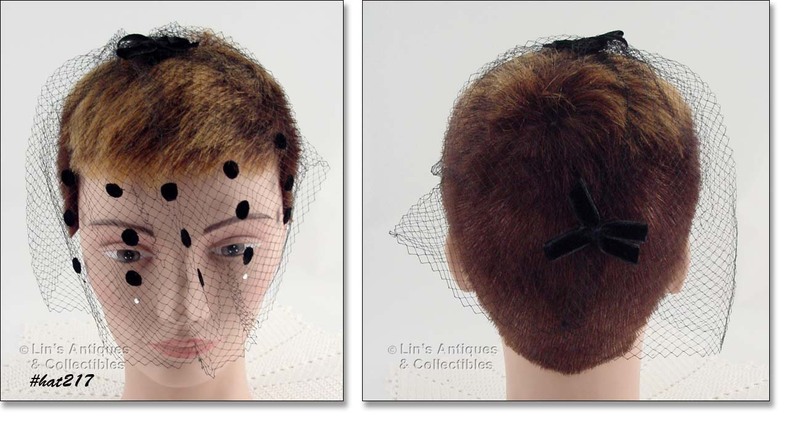 THIS ONE IS BLACK VELVET WITH BLACK NETTING VEIL THAT HAS TWO VELVET ROUND DOTS ATTACHED TO THE VEIL. EXCELLENT CONDITION! 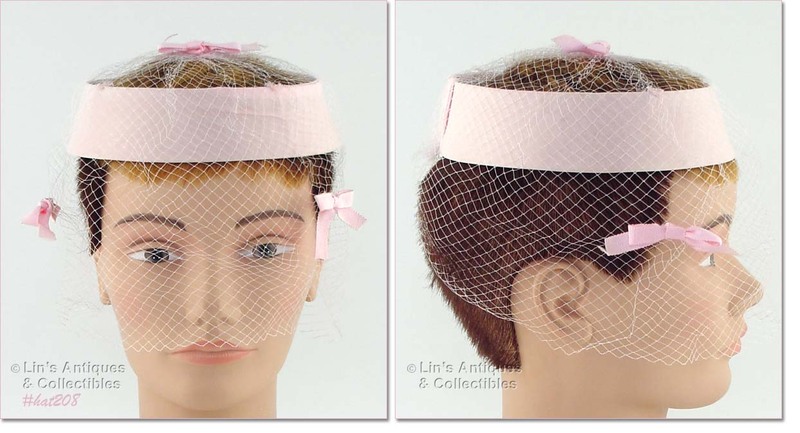 VERY PRETTY CAGE STYLE HAT – IT’S PINK WITH PINK NETTING VEIL! THERE ARE 3 ATTACHED GROSGRAIN RIBBON BOWS – ONE ON TOP AND TWO ON THE VEILING. EXCELLENT CONDITION! ISN’T THIS A PRETTY HAT? 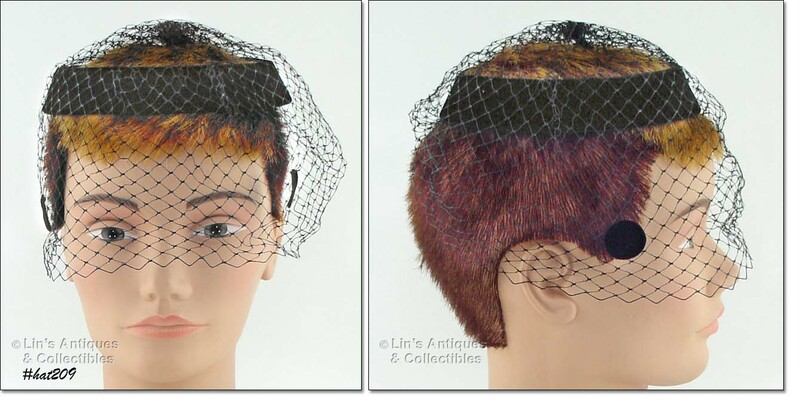 ITS CAGE/BAND STYLE WITH BAND MADE OF BLACK VELVET AND IT HAS BLACK NETTING VEIL. 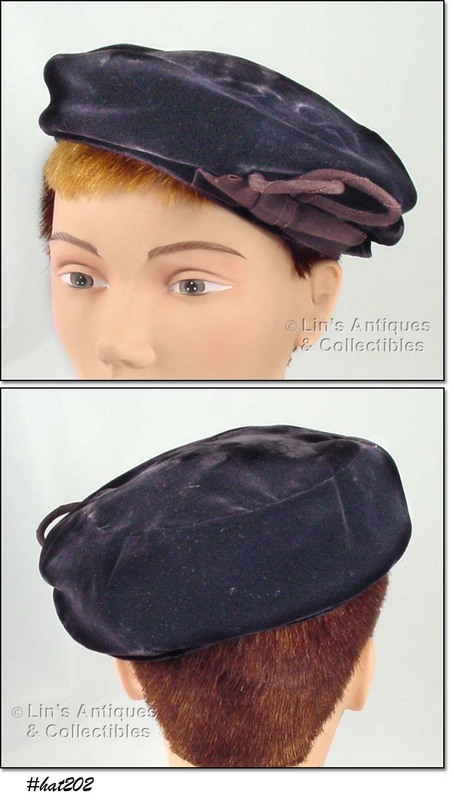 THE TOP OF HAT HAS A ROUND BLACK VELVET LARGE “DOT” THAT HAS BLACK FEATHERS IN A PINWHEEL DESIGN! REALLY NEAT! 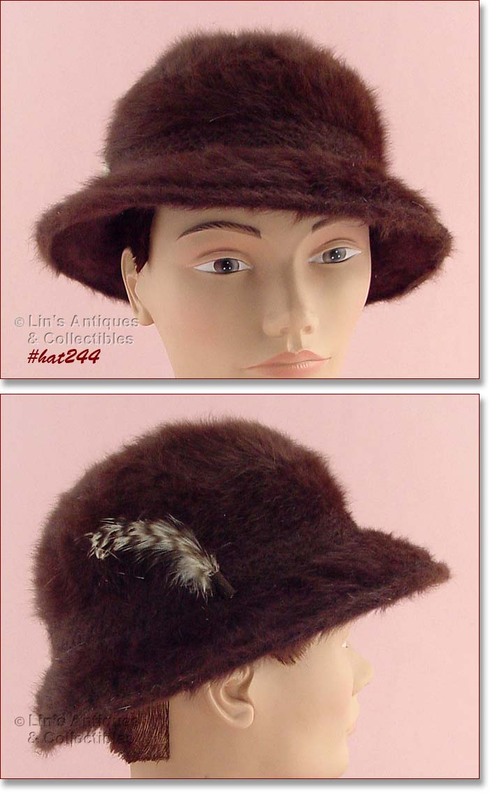 THIS LOVELY VELVET HAT IS A RICH DARK BROWN COLOR ACCENTED WITH A BROWN BOW. REALLY PRETTY! I REALLY LIKE THIS HAT! IT’S WINE COLOR WITH A BOW IN BACK. HAS “JANE MORGAN COLLECTION” LABEL. PRETTY! ANOTHER REALLY NEAT HAT! THIS ONE IS BLACK RAFFIA WITH A BLACK VELVET BAND WITH A LITTLE ATTACHED VELVET BOW. THE HAT HAS BLACK VEILING THAT EXTENDS ABOUT 1”. INSIDE LABEL HAS “STYLED BY JULI-KAY, CHICAGO”. NICE! 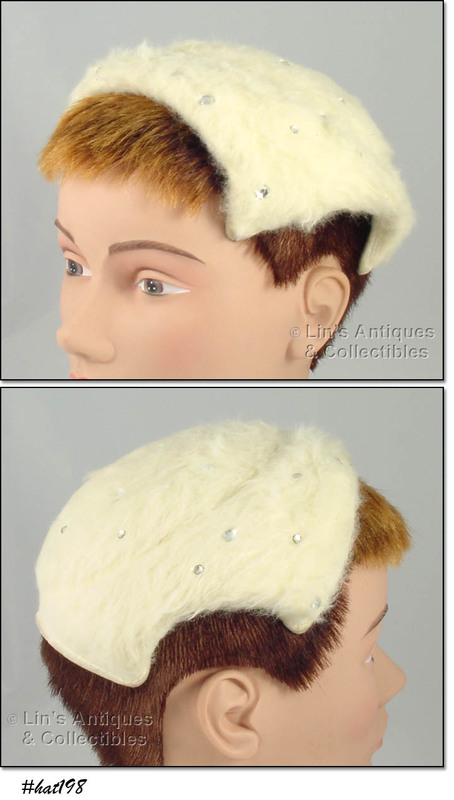 NEAT WHITE FAUX FUR HAT WITH CLEAR RHINESTONES! VERY ATTRACTIVE.